What a pity, this looked like a great product. But, without USB (when all the competitors have multiple USB ports and USB 3) I won’t be investing in amplifi. There are a lot more reasons don't buy amplifi. to simple parental control, no possibility to set speed limits, wifi connection problems with android and iOS. No support of usb port. No guest network in Bridgemode. Very simple firewall settings. But the biggest problem is, there is no no firmware no improvements and Bugfixes. Over all my amplifi is in Bridgemode behind a 50 € microtik router who can handle all wishes. If he found a system that handle the wishes I will sell amplifi and buy it. I have my router in Bridge mode and was able to configure a guest network. Also, I was able to use my previous router (extend network, WiFi off) connected to my AmpliFi router over Ethernet and share a drive connected to the other routers USB port. Not ideal, but if your older router had this feature (mine is an Apple AirPort Extreme), you may be able to make it work. @h-an You may be interested in our beta program. A lot of active development going on there, with the chance to influence our priorities. Also, we've just come out with a new public release. Here's the changelog https://community.amplifi.com/topic/539/firmware-v2-6-0. 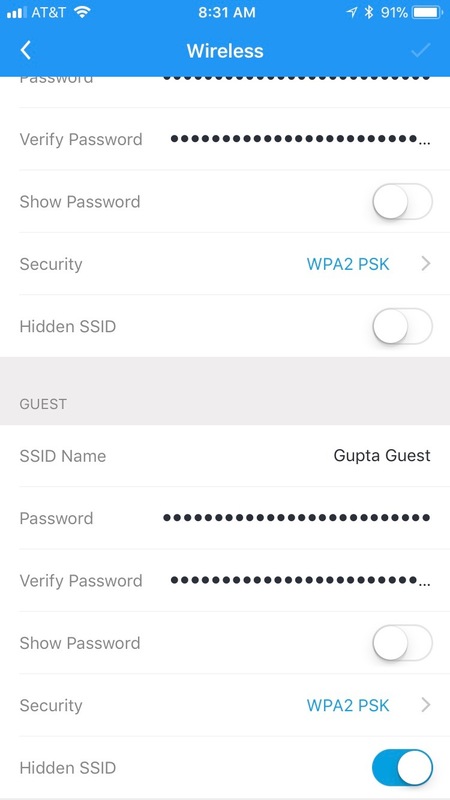 In Bridgemode and guest network (also in 2.6) I just updated there is no possibility to activate the guest network in amplifi. Please send me the howto or a screenshoot. I buy normaly one router and do all things with them. A second router waste money (expensive USB port functionality) or waste speed with double nat. I am very interested in a beta program but without a possibility to set combined speed and time limits in perantal control it's useless for me. guest wlan over all max speed of 30% of free capabilities from my wan port. I will not have poor speed in my wlan because guests take the whole capability. I think it's a skin for ip-tables and queues. At the time I used in Microtik os it with these things.... Skript with different queues for the single restrictions and a timer based activation for the single scripts. Are there any plans to implement such a function ? P.s. excuse my poor English. Re: Guest Network - See attached screenshot - am I missing something? My Amplifi router is in bridge mode and I am also on 2.6.0. Before I turned on the hidden SSID, I could see the guest network. Than you have a special version. I'm in Bridgemode And the complete guest tap is disabled. When you can configure the guestmode in the way (FAQ How do I set up and configure a guest network?) you are not in the Bridgemode! I use firmware 2.6 and android app. When you can configure the guestmode in the way (FAQ How do I set up and configure a guest network?) you are not in the Bridgemode! Hmm - not sure how this is working then. I do have bridgemode enabled. App is iOS. The routers are new - installed this week. Maybe someone from Amplifi can comment? @rakesh-gupta What does it show if you hit the 'guest' tab on the bottom of the screen? I've replicated all the screenshots on a fresh router, but when you go to the guest tab to actually enable the guest wifi, it says 'Not Available - This section is not available in bridge mode'. So while your screenshots are 100% correct, it technically doesn't work. I can't see the guest SSID with or without it hidden. Can you disable hiding your SSID and see if it actually comes back? Or if you can actually attach to it hidden? It looks like on iOS you can "configure" the guest network but it doesn't do anything. I went back and turned off the "Hide SSID" switch and the guest network was not available. Also, there was nothing on the "guest" tab. @h-an It's not planned at the moment, but we'll be selecting new features from this thread after we finish more urgent priorities https://community.amplifi.com/topic/316/call-for-feature-requests-1. That's exactly what I mean with "Noting going forward with the system firmware". You have a section Suggestion in the forum. I posted my suggestions there 5 months past. @h-an I wanted a new thread so people can vote on features, and they're all in the same place. We'll get to start implementing some of them soon.